You have added Flower Patch Embroidered Strapless Dress in Sky into shopping cart. We love the contrast of the off white flower designs against the background of this pretty strapless dress. The Flower Patch Embroidered Strapless Dress is fully lined. It has a strapless neckline with elastic in it. The bust has a flutter top with off white embroidered flower designs that create contrast. The attached skirt has off white embroidered details throughout the skirt and around the bottom hem. The Flower Patch Embroidered Strapless Dress is a cute look for summer that would be perfect to wear to a summer party or concert. It looks nice paired with flat beaded sandals or wedges. Details: Fully lined. 100% polyester. Lining: 100% polyester. Hand wash with cold water. Do not bleach. Wash separately. Low iron inside out. Small measurements: Length from top of bust to hemline: 30". Bust: 30". 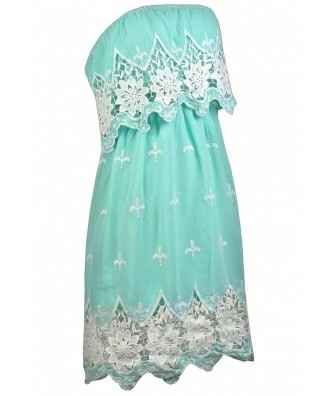 You have added Flower Patch Embroidered Strapless Dress in Sky into Wishlist. 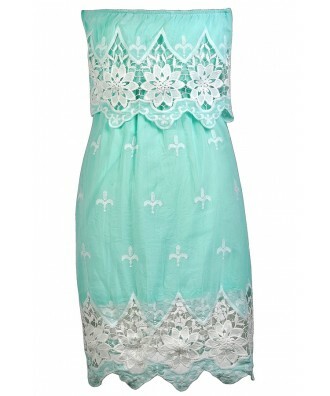 You have added Flower Patch Embroidered Strapless Dress in Sky for Stock Notification. You have set Flower Patch Embroidered Strapless Dress in Sky as a loved product. You have removed Flower Patch Embroidered Strapless Dress in Sky as a loved product.